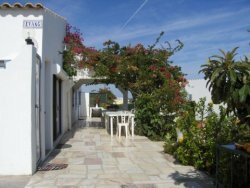 Our place is 25 km east of Faro airport. Originally a farmhouse it has been extensively moderized and expanded. We have 16 000 sq.m of land. The garden includes flowers, grapes, fruit trees, figs, almond, carobs, olives and a lot of oranges. 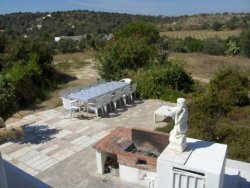 The location is rural, with nice views to the hills and sea. The charming village of Moncarapacho is a ten minute walk away, with three or four exellent restaurants, shops, caf�s, an internet caf�, postoffice, banks etc. Wireless internet connection available. We often get groups of families. The pool measures 4 times 9 meters. Shallow end 90 cm, deep end 2 m deep. The pool is safe, protected by a hedge and gate. Solar heating. The lounge has a fireplace and satelite TV. There are six bedrooms in all. The main house has four: Bedroom 1: one double bed, bedroom 2: four single beds, bedroom 3: a double bed, bedroom 4: two bunks. In the annexe, built for guests: bedroom 5: a double bed and two bunks, bedroom 6: a double bed, a luxury bunk and a pull-out bed. There are two bathrooms with toilet, shower and washbasin, one extra toilet with washbasin, and a walled outdoor shower, all with hot and cold water. A cold-water shower at the pool. The ocean is only 4 km away. The sand islands have the best beaches in the Algarve (source: The Rough Guide). They are just a short ferry trip away. You can also bathe on the mainland. Bring your own beach-towels. This area of the coast is a protected bird-breeding area. Building hotels on the coast is forbidden. This part of Algarve is therefore much less crowded than the tourist ghettos to the west of Faro. We are 3 km south of the east-west motorway. All the attractions of Algarve and Andalusia in Spain (Seville!) are easily reached. We, the owners, are a retired Norwegian professional couple. We live nearby, and are available for advice etc. In 2008 these rates are for the first eight guests pr. week. The rest pay two thirds pr. person.